Trying to change directory results in an error: "Cannot change directory". Opening a Shell link to local PC works without problems. 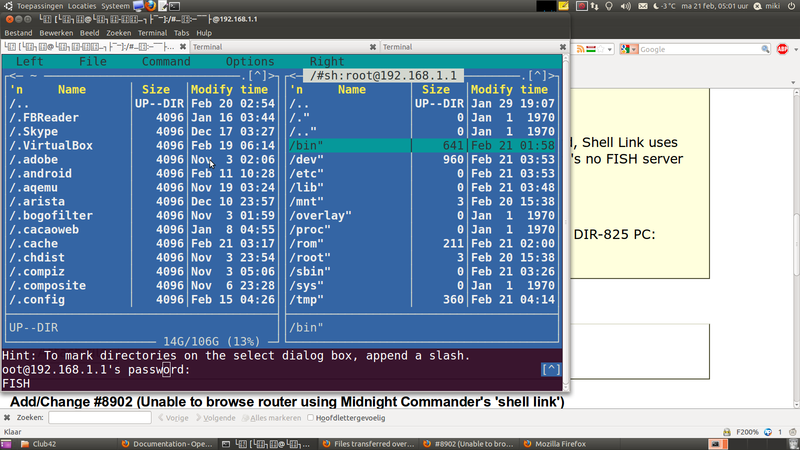 From what I understand, Shell Link uses FISH protocol over SSH (which falls back to using plain shell commands when there's no FISH server available). badnames.png​ (248.2 KB) - added by miki@… 7 years ago. The mc "fish" backend tries to parse remote directory listings which fails since the busybox ls output slightly differs compared to GNU ls. You can try to install coreutils-ls on the router and remove the /bin/ls symlink to busybox - I believe it will fix this issue. It is unlikely that we alter busybox to match the gnu ls format, however we're open to patch suggestions. I've tried installing coreutils-ls and removing the /bin/ls symlink to busybox and rebooted the router. In a normal ssh session, 'ls -l' and '/usr/bin/ls -l' now give the same output, which differs visibly from 'busybox ls -l'. Sadly the problem with MC Shell link is still the same. Could it be that 'busybox ls' is hardcoded somewhere? I've got the same problem and it's not BusyBox fault. The problem is with parsing 'ls -Qlan' output by Midnight Commander. I've straced both Dropbear SSH server + BusyBox 1.18.4 on embedded machine and OpenSSH server + coreutils on PC. The same behaviour on both systems when PERL is not available and MC fallbacks to 'ls -Qlan'. The suffix appended to file/dir-names in MC listing is exactly '" ' (quotation mark + two spaces). I've tested all the commands MC executes on remote host and all of them give proper output (without such strange names). By the way, outputs from 'LC_ALL=C ls -l /' and 'LC_ALL=C ls -Qlan /' on both systems are the same (excluding different files on both platforms). Oh, really sorry... I was in hurry and haven't looked as it's OpenWRT, not Midnight Commander bug report page. I've tested that with MC 4.7.5.1 everything works fine.